System in aluminium: (Head in steel for model 2000 Kg and 3000 Kg). Telescopic feet : Aluminium adjustable bracket with a pitch of 150 mm. 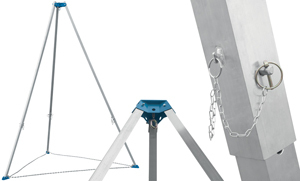 Attachment of the feet by a galvanized chain with a snap hook. Suitable for all floor : Articulated feet featuring two positions for hard or soft ground. Flexibility of movement due to its light weight.